IRC Section 162 Executive Bonus Plans funded with cash accumulation life insurance policies have provided a time-tested non-qualified benefit for many years. The employer simply makes a tax deductible bonus to the shareholder-employee or non-owner key employee who then reports the full bonus as W-2 earned income. The bonus is used to pay an annual premium for a personally owned insurance policy. Future FIFO withdrawals up to cost basis and policy loans can be made tax free. 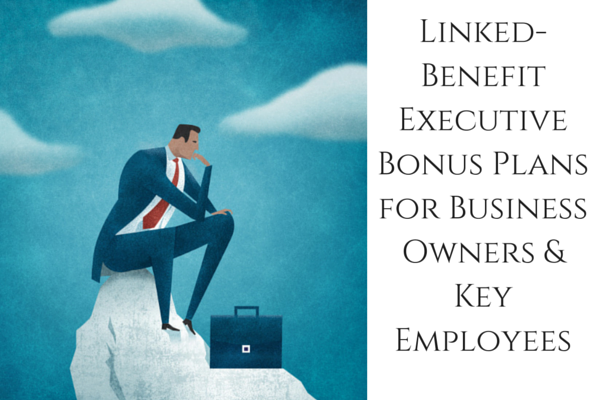 The employer may even pay an “extra bonus” so that the shareholder-employee or non-owner key employee has enough cash to pay both the tax on the gross bonus plus the full policy premium. The shareholder-employee could be the owner of shares in a C Corp, S Corp, or LLC. A new type of Section 162 Bonus Plan is available for business owners and professionals. It’s called a Flex Pay “Linked-Benefit” Executive Bonus Plan. Maybe the most practical “linked benefit” type of life insurance product is a “flex pay” type of product that provides basic life insurance protection along with valuable long term care (LTC) rider benefits. The premium payment schedule for a guaranteed paid-up contract is typically 5 to 10 years. Any LTC benefit claim payments are received tax free and will simply reduce the death benefit down to a minimum residual amount. Charges against cash value for the cost of the LTC rider are simply a tax free reduction to the cost basis of the policy. 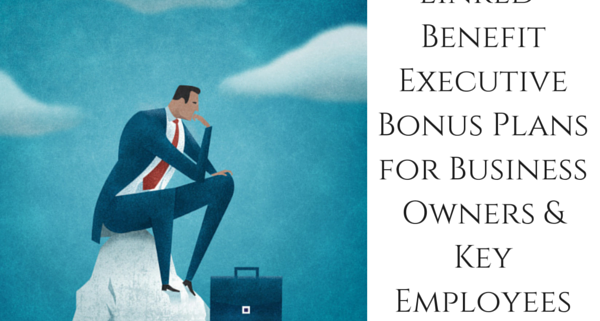 The annual premiums for this executive benefit is generally deductible to the employer as a compensation expense under IRC Section 162 and is currently taxable to the shareholder-employee or non-owner key employee as W-2 earned income. • A shareholder-employee, a 50 year old male, is the majority owner of a successful S Corp, and is in good health. • Purchase a 10-Pay “Linked-Benefit” Flex Pay life insurance product owned personally by the business owner. Lifetime benefits are guaranteed with only 10 premium payments. • In a 33% personal tax bracket, the firm could pay an “extra bonus” so that the shareholder-employee has a so-called “zero net after-tax outlay” from a cash flow point of view. (Extra bonus is $5,000. Total taxable bonus each year is $10,000 plus $5,000 = $15,000). • As annual premiums are paid, a graduated vested Return of Premium (ROP) benefit accrues for a complete surrender of the contract. As you can see from the chart above, a very substantial Life-LTC “Linked Benefit” program has been funded by business cash flow. The client has locked-in a tax-free death benefit for his family of at least $173,779 if no LTC claims are ever made during lifetime. The client can get back the full $100,000 premium outlay in cash by a simple surrender request after the contract has been in force for 10 years. And, most importantly, the client has $7,241 of monthly LTC protection ($86,890 annual LTC protection) available over a minimum 6 year duration period with a cumulative total benefit of $521,337. The current annual cost of different types of extended care generally ranges from about $6,000 per month ($72,000 annual) to about $10,000 per month ($120,000 annual) depending on the state where care is delivered. These costs continue to rise significantly from year to year. The personal net after-tax cash flow outlay to the business owner is zero ($0) because the bonus was “grossed up” to $15,000 so that he had enough to pay both the tax on the gross bonus (33%) PLUS the annual $10,000 premiums for the Flex Pay “Linked-Benefit” contract. Contact your BSMG Advisor today to discuss how business cash flow from C Corps, S Corps, and LLCs can be used to fund personal LTC protection needs of shareholder-employees or non-owner key employees. Note 1: A “linked benefit” life insurance/LTC contract is defined as life insurance under the Internal Revenue Code. These “linked benefit” type of life insurance products are NOT to be confused with “stand-alone” LTC contracts which have no life insurance component in their basic design. (4) Tax free “accumulated adjustment account” (AAA) distributions of previously taxed profit for owners of S Corps ….. or tax free “capital account” distributions of previously taxed profit for owners of LLCs. Contact your BSMG Advisor for a discussion of the differences between “linked benefit”, “stand alone” LTC, and universal life /LTC rider types of products available on the market today or check our our video blog.